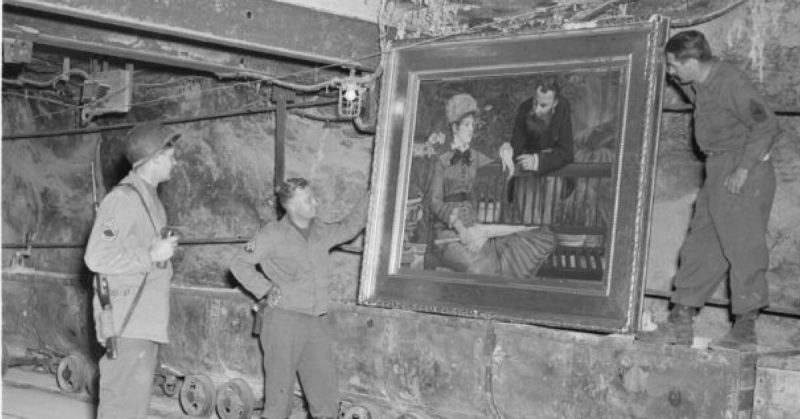 US Soldiers recover Manet's In the Conservatory from a salt mine stash of Nazi loot in Merkers, Germany. Other treasures are still missing. Hundreds of tons of gold, 13,000 pounds of precious amber, more than hundreds of thousands of diamonds, even the fossilized remains of Peking Man and other treasures have been missing since WWII. From the forests of Poland to the South China Sea, treasure hunters have been trying to answer this question for over 70 years. It remains mostly unanswered, but there are clues and eyewitness reports that point to the locations of each missing treasure. Some sites are surprising and are found in any corner of the world. A Nazi train filled with gold is thought to be hidden near Wroclaw, Poland. Treasure hunters are using radar to try and find it. If successful, they may be up to $10 billion dollars richer. The search for the Amber Room from the Russian Imperial Catherine Palace goes on and is also thought to be in Poland. Russian preservationists in 1941 thought it was too delicate to take apart, but German experts on the subject managed it. Were they successful in preserving it for 75 years? Why did the men that buried Yamashita’s horde of gold not survive WWII? Not a single one of them. The answer lies hidden in caves somewhere in the Philippines. It is possible the United States intelligence community knows. Heinrich Himmler confiscated diamonds and gold which he used to create a cadre of soldiers in the Bavarian Alps. No one knows quite where he hid the horde, but treasure hunters believe a map was coded in a piece of music by a famous composer. The code is thought to have been broken, but the searchers are afraid to look for sure as they believe the route to the treasure is rigged and dangerous. The Missing Link was aboard a Japanese ocean liner on its way to Singapore at the end of the war when it was sunk by a US submarine. The ship was supposed to have safe passage as a Red Cross vessel, but the US made a mistake. Apart from the remains of the fossilized Peking Man, there was $5B worth of treasure on board. Where is it now? The following video shows images of the places, treasures, and people involved in these mysteries and explains the events that led to these treasures being lost. Find out where researchers believe these treasures are and about the cover-ups and efforts to keep them hidden.